photo by Mariana Schulze..Hanging out with the Queen of Pentacles…earthling pondering in an old silky gown in a field at dusk, the usual. Sometimes we bury ancient feeling because it is too much to hold all at once. But if it isn’t nurtured like a seed, soaked with water from skyward eyes until it’s soft enough to unearth in layers, or trimmed, transplanted, and re-sprouted from snapped stems, ancient becomes present becomes future. When we own ourselves inside the emotional energy dancing through our systems, we can honor it before it becomes a ball of grief launched like anger or confusion in the wrong direction, away from the heart, before it becomes a story woven through every life down the line, until one day someone who has inherited our memories says, enough. It is time to set down the weight in our marrow, ask it what it needs us to know, and reimagine the ground we walk on. It’s time to know our own belonging here, to hold what has only ever longed for love. Changing isn’t the thing we’re after, it’s just what happens, when we’ve called our spirit home to its earthly form for long enough to know it’s rhythms, understanding there is only being with and loving through. Energy moves if we allow it. There are waves we haven’t tasted and winds we haven’t heard, keep noticing. We know when we know. If it’s not clear yet we keep listening. Muddiness settles without our hand in it. Clarity will come little by little or all at once and we will know, we will know, we will know. When we sit in stillness and let ourselves be moved, there is a sacred untangling in breath and belly. We can be there for the undoing. We can be there for the restructuring. We can be there for countless initiations, watching the space grow around us, making room to fill into, watching a new life materialize before our eyes, noticing the weathered hands of grace taking our own, and walking us slowly through another door. Surrender as a creative act of listening. Feeling as a creative act of aliveness. Changing as a creative act of embodiment. Stillness shows movement where to grow from. Movement helps stillness know its own ground. An offering, a dedication, to continually breaking open, pausing at the reflection found at the end of a road, any road, spiraling into other, into sameness, into the unfolding of an uncertain map–the open palm, the spark, the ether and the soil. Leave something behind in this ritual of burning. You will leave everything behind. Belongings too heavy to carry become remnants, fragments lived and unlived, and your own belonging remains—to this earth, this body, this heart, each other. You will find freedom in touching nothingness, and find another you in the returning, moving through the pathless mountains, knowing lightness and burden, the giving up, the longing. The well of love is the other end of grief, filling nothingness with stories, and who would we be without them? Without someone to share them with, without someone to remind you how nothing lasts, but it lasts long enough to love. To keep letting go until nothing is left but the light that started it. You are the bright breath among blackened branches, reaching out to your own unseen hands, the ones that hold the stars, with eyes for the invisible. And you pull out your heart, again, and let it rest on a sunlit stone, warm and beating, poised for the next reckoning, or blessing, or silence. A heart who asks you only to be, who tells you it will be enough. You learn how to hold tightly for a time, because you don’t want to turn away from what you know while it becomes something else. Love will have you relinquish everything, at some point. Full bodied emptying before the filling, how fire moves from roots to trunk and exhales at the top, how lungs do in a clear-sky dream, when you take an inhale deep enough to turn green with hope. You will all push up through the wreckage and grow, and die, and be something important in between. It continues. And you are here for it, for a little bit. Lucky enough to be. Enough. You are the little seed who comes to life after the fire. All together on the hill, rising through the layered soil of memory, using it for rising, living, opening. An offering. For me, soul is where spirit and body merge, the place where we can explore our multidimensionality, the many layers of our experience. Strength is the card in the Major Arcana where our animal bodies meet our spiritual selves. I want to share with you some simple methods for reconnecting to your body, your energy, and in turn, your soul, so you can feel safe and strong enough to journey into your deeper layers. While our spirits are whole and complete, our bodies take more time to catch up. “Catching up,” or merging spirit and body, is what we are here doing, and it takes time. When our bodies are grounded, more of our own energy can occupy our space, and we are available to listen and tend to our sensations and needs, instead of being bombarded with outside energy, or operating from a system that needs more soothing than stimulation. You know the feeling of being overwhelmed, when you just can’t get your space and you want to throw your hands up and say, “enough!” We have all been there, especially as sensitive beings. When our systems are overloaded with stress, we go out of body or we shut down; while helpful in the moment, over time it creates issues around having access to body awareness and cues that tell us we need to set a boundary, or leave an unsafe situation. It can also disconnect us from access to our feelings of pleasure, joy, desire, and love. Our deepest knowing lives inside of our bodies, and if we are disconnected, we remain apart from the magic of truly trusting ourselves. We also become more susceptible to outside energies that can knock us from our center, our place of inner strength. It becomes harder to access higher wisdom from a place of wholeness, where the facets of us that need healing have been met, loved, held, and integrated. Disconnect happens through cultural messaging, as well as through trauma. We have all the wisdom within you already, it is simply a matter of committing to uncovering it and honoring it. When we can acknowledge the pieces of ourselves calling out for our attention, we can begin a new relationship with those aspects of ourselves that are longing to be held and expressed, so we can live mindfully, rather than having our unconscious bits take over and cause a ruckus in order for us to be able to see what it is we need to be paying attention to and respecting within. We try to tame the wildness within us by turning away from these pieces of ourselves, because it can be scary to meet these raw and unruly pieces; until we realize these parts of us are the treasure, the ones who will require us to step out of expectations and into our true desires, intuitive nature, and personal power. From a grounded place, we can allow space for our creative nature, emotions, and untamable wildness without trying to control, suppress, or stamp out our shadow or our light. When we do so we encourage everyone around us to step into their truth courageously and compassionately as well. This is the practice of presence and dynamic aliveness. This is the practice of learning that strength does not mean force or control, but rather being with ourselves closely, and listening kindly to what is here for us to be with and love through. At its core, strength is about self trust, which will allow trust to exist in our relationships to all that is. If you don’t feel like getting outside, you can create a ritual for yourself indoors to tune in. Make it work for you, keep it simple. There is no wrong way to create a ritual, it is as simple as being with yourself, and you can get creative. You can light candle, burn some sage or palo santo, put on some music, or create an altar with some of your favorite stones and images that evoke a feeling you wish to honor. The purpose of ritual is to acknowledge something sacred and personal, to recognize a threshold has been crossed, or a journey that is beginning or ending. It is grounding and centering, and keeps the sacred alive in the “ordinary.” I love to create altars as a simple ritual of reverence to the sacred in the ordinary. Altars are a way to a sense of home wherever you are, a reminder of your power to create safe spaces for yourself. Any space can be transformed into an altar, and anything of meaning to you can become a part of this creative dedication. See the altar as a living prayer, a liminal space bridging seen and unseen worlds. I place little offerings of love to the mystery, to spirit, to the unfolding self, to the earth, to the cosmos, to those who have gone on before me, to icons of divinity or humanity– any piece of inspiration along the journey. I may write something to call in or release and place it on the altar with intention, or I may collaborate with another person or a group of people, a creation honoring the collective vision. The altar exists in the space between stillness and movement, between knowing and un-knowing, where I give deliberate attention to the moment. Making time for creative expression is so valuable. It doesn’t have to be big or grand or even beautiful. It is just about making the space for something to be expressed through you. It is about being moved. You can gather together magazines, glue, paper, colored pencils, or paint, and make a collage. Collage is a wonderful way to explore the subconscious. It can be very interesting to see what images draw your attention, and then to start noticing a theme coming up as the images collect. Freely painting or drawing without an intentional outcome is also a way to move into the flow without the critical mind determined on “outcome” getting in the way. Dancing to your favorite music is another way to move beyond what “makes sense,” and into pure sensuality. Drumming is also a potent way for me to come into presence with the rhythm of my body and energy; letting myself be moved by the beat that comes through is grounding and enlivening. More sensuality, less sense will bring you more here, and less somewhere else. Getting out of the logical mind and into the body and emotions really helps move energy, emotions, releasing perfectionism, stagnation, and soothing the nervous system. Stagnant energy can result in bottled up emotions, which can result in aches, pains, inflammation, and general funkiness. On that note, maybe being creative, going on a walk, cleaning your space, or making time for a self-created ritual feels like too much right now. How about just getting some bodywork? Lying down, breathing, and receiving is an amazing way to reconnect to yourself. Or maybe being alone and quiet doesn’t sound helpful, and you just need to talk to someone and let it all out. None of this has to be complicated. Inner strengthening is all about listening to your deepest needs. Keep it simple. Keep it present. Keep it you. Having a meditation practice focusing on grounding reconnects us to the earth to replenishes vital life force. Sinking into this stillness and being with what is, will naturally clear away energy that is draining you. I like to think of it as bringing me back to me; after all, we are made of the same components of the planet! Grounding through meditation will help keep you balanced, with greater grace and fluidity. In order to unwind and release, we first have to anchor. Once you connect with your body, and the flow of energy between you and the earth, you really don’t need to worry about “doing” anything except being present. It is about connecting you to your body, your basic goodness and well being, and creating spaciousness in your experience. Allow what comes up to come up; focus on you in the present moment. Trust that with practice it will become easier and you will see changes happen externally when you can come back to yourself again and again. You can do this anywhere, at anytime. It is the simplest and most profound practice of energy management, and often overlooked as so much of what we are taught is about “getting somewhere else” to get what we need. My favorite way to ground through meditation is in nature. Whether you live in a city or in the countryside, find a spot that feels inviting. Sit on the ground, perhaps with your back against a tree, or a rock that hugs the curves of your body. Take a few deep breaths from your belly; inhaling in through the nose for 4 seconds, out through the mouth for 8 seconds. Or gently breathe from the belly, letting it rise and fall with the inhale and exhale. Feel that all that you need is right here, right now. Imagine opening your root chakra, at the base of your spine; feel a golden thread, dropping all the way to the center of the earth (or imagine it however feels right to you.) As you anchor in, receive the energy of the earth. Feel your body as the earth, the earth as your body; feel the interplay of energy. Feel how held and supported you are. If you want, you can imagine the cord, or thread, spreading out as wide as your hips. Feel the fullness radiating down your legs, through the bottoms of your feet. Open the energy centers at the bottom of your feet, connecting down down down to the center of the earth. You can also visualize your body as a tree, or a rock, or the ocean, and feel what that is like. Feel the earth energy running up through your entire body, through every cell, muscle, bone, organ. Feel yourself being nourished. Feel you coming back to you. Stay in touch with your breath, but don’t worry about how you’re breathing, just be with it. You can also visualize the energy moving through your auric field, the space that belongs to you, all around you like a beautiful globe that protects you and nurtures you. I also call in colors that feel healing and nourishing. Gold, violet, and emerald are my go-to colors that fill me with unconditional love and strength. Make grounding a daily practice, whether that is through time in nature, ritual, movement, body care, creativity, visualization, or breath, or whatever feels essential for you. You are in charge of your space, and your intentional practices will greatly strengthen your body and energetic field over time, making your boundaries clear, your vitality bright, and the way you move through the world graceful and connected. I am the still earth at the bottom of the ocean. I am the currents of wind and water too vast to hold in one place. I am the fire of the beginning and the end, neutral at the core. I am a human, humbled and held by some incomprehensible energy that brings me to my knees. I do not pretend to understand it. I am just here to move and be moved. To choose and be chosen by. To offer that we are too small to explain it and too big to do so either. I am a vessel who lays bare her armored chest, standing naked and weeping for a world who forgot that saving itself doesn’t require drowning. But still, some will, because they were not given a chance to know safety in their own skin. Where we were told we were unsafe and untrustworthy in the depths of our physical, psychic, emotional lives, I am here to find my anchor there, to show us one way it can be done, a changing body on a changing earth, with a speck of stardust at her center that remains intact inside the wild shifting dark. I am here for you and your guttural commitment to fully exist, and trust in the strength of your devotion to really be here now, in the untamed field of listening. The gift of leaving the unnameable unnamed, of feeling the outer edges of a life in contraction before expansion. The tender beauty of relentless alchemy. Gatekeepers, guardians, travelers between realms: unbind the stones from your feet and sing your life into the deepest part of the river. Listen, listen, listen, as Spirit speaks. You are not separate from any of it. Your beauty moves in all the changing ways, without knowing who you will be on some other side, which is really always just right here, a black-winged moment, and you, inside it. Your will can’t hold transformation the way it wishes it could. You can only let it take you. If you trust nothing else, trust this. You and your beauty, changing, here and in every in-between. The High Priestess is a gatekeeper to Mystery, who calls for us to access our intuition and innate wisdom from the depths of our psyche. She is the keeper of ancient knowledge passed down through the ages, who reminds us that surrender is sacred. She sees all as a wise observer, all-knowing yet neutral, a cosmic queen who walks the earth, moving like water between realms. She is visible when she wishes to be, and cloaks herself in the same breath if her intuition calls for it. The High Priestess honors the liminal, the ephemeral, and the empty spaces yet to be filled. She speaks to us of our ever-burning inner flame, kept safe within a temple whose walls hold the records of all that is, was, and will be. She calls us to settle into the unknowing, and let there be space to open into. The High Priestess is an archetype that portrays one aspect of the Divine Feminine, a term that I relate to as the yin essence, the fertile void, the unknown, and the connectivity of all things. Varying expressions of the Divine Feminine blossom and wither from one source of wholeness, as she is a container vast enough for all to exist within her. 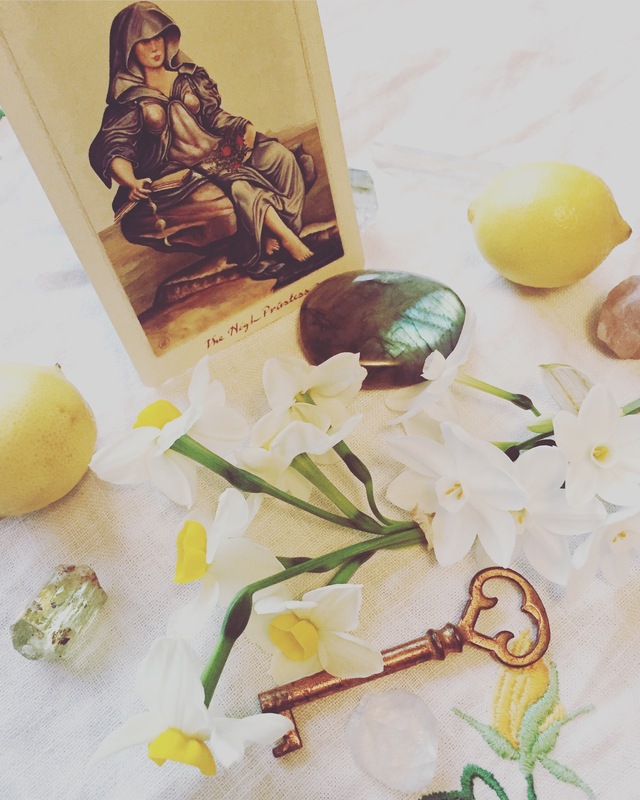 A powerful way to explore different expressions of feminine energy and the complex layers of yourself is to dive into archetypes, which is why I love tarot and its connection to mythology. Persephone is a goddess I connect with whose myth tells the story of a maiden (Innocent archetype) torn from her life in the sun with Demeter (Great Mother archetype) and taken against her will to the underworld. But Persephone is also the High Priestess, as expressed through the Dark Goddess archetype. Her story through the patriarchal lens emphasizes her victimhood, diminishing her power as a realm traveling goddess of the unconscious, bravely traversing the shadow realms. What isn’t so widely shared is that she chose to stay in the underworld, and brought back gifts to the light when she was ready to share them, reflected in the changing seasons. She honors our countless initiations and threshold crossings, and our own timing through which we move. She reminds us to move at our own pace, to stand sovereign in our own energy, to own our choices and our power completely. Artemis is another goddess whose energy speaks to both the Wild Woman and Dark Goddess archetypes. She is the one of the woods– embodied, emotive, unapologetic, intuitive, creative, brave, and unto herself, belonging to the moon, the earth and the wild things. Exploring these expressions of the feminine connects me to my soul’s yearning to embody the fullness of me, to arrive here and claim my voice as the witch. The wild one. The deeply feeling healer. The empathic and psychic one. The writer. The creator. The shadow dweller. The light worker. Guardian and guide between worlds. What happens when I full on surrender to the present moment? How does accepting myself where I am allow me to actually begin changing? How do my own internal shifts effect change in the world around me? What happens when I start to get more into my body? How does it feel to find stillness? How does it feel to move my body from that point of stillness? Note the sensations, emotions, and thoughts present. Who will I be on the other side of another transformation? What will I have to leave behind? What happens when I show up in the world with all the shadows and light that I know I am? What do I need on a physical and emotional level in order to feel grounded and safe? How am I meeting my own needs in these ways? How am I honoring my own growth and tending to my needs at this point in the process? How does staying with myself and loving myself through my entire growing process strengthen me? What does trusting myself feel like physically? Does it feel calm, even if I don’t exactly “like” the information I am getting? How can I get myself to a place of calm in order to intuit from a more observational viewpoint? How does observing and witnessing my own experience help me respond, rather than react? How can I cope with my own insecurities around being truly seen by truly seeing myself? What do I need to feel, accept and love about what I see when I explore myself honestly, so I can be with what is and transmute what I am ready to change? In what ways do I choose to be in alignment with my true needs, rather than in resentment because I am not honoring myself or listening to my intuition? Will I be able to show up in my fullness without the fear of being “too much?” or “enough?” What does the cultural programming of “enoughness” look like? How does it affect the choices I make? I willing to disappoint others, rock the boat, and be uncomfortable in order to stay true to myself? Can I identify when a wounded aspect of me is operating and clouding my judgement? What aspects of me still remain as fragments awaiting full acceptance, unconditional love, and forgiveness? Can I acknowledge them, hold them, and release them with deep love so I can more fully occupy my own body and energy? Can I begin to notice when I am grasping outside of myself for validation to quell inner discomfort? In what ways can I validate myself? How does validating my own experience create more grace and ease in my life? I belong on this wild, breathing earth. I am capable of holding this great responsibility. I am brave. I am powerful. I call all of my power back to me now. I am safe. I am grounded. I am connected. I am fully resourced and operate from my wholeness. I trust myself fully. I validate my own humanity. I feel my own divinity. I am loving. I am patient, gentle, and honest with myself through the journey, accepting my wholeness as I change. I honor my interconnectedness with all things. I practice responding rather than reacting by slowing down and asking myself what I truly need. I take time to feel what is present for me and I listen. I practice receptivity and openness when my protective pieces urge me to shut down, trusting and loving all facets as sacred. All I need to do is be here, and pay attention to what moves me. I am deprogramming every belief and pattern of energy that does not belong to me, and that is no longer needed. I am allowing myself to receive new information about all the ways of being that reflect my true essence and soul’s purpose. I am continually diving into the way these archetypes are reflections of my being, feeling how they hold and nurture each other, how they are part of a greater cycle, and how they cycle through me in my own phases. Below is some more writing that came exploring these faces of the Divine Feminine. I went to the water with my heaviness today. This is my secret spot I always go to alone. This water hasn’t flowed here in a very long time. The first water in a drought will conjure up all that has laid dormant, it will run muddy and carry with it tangled branches, and it is not conventionally beautiful or pristine. The first water will bring to your attention all that you wish you didn’t have to see. It will tell you stories you wish you didn’t have to hear. Chasing the light is easier than communing with the shadows. After a little while the clarity comes, the peace comes, if you submerge and surrender for long enough. After a little while you understand that the light doesn’t care to be chased, just respected as an integral piece of the spectrum, a warming ray of what is possible, of who you are at your core. I prayed into the water, washing my hands clean, asking for guidance. She told me to listen, and to trust what I hear. She reminded me that there isn’t a savior beyond our own understanding that we are part of an eternal river’s ebb and flow. There are layers to healing. There is no easy answer or endpoint, just the willingness to pay attention, to feel, and to trust the wisdom of our experience. The more powerful we become, the more we are asked to kneel closer to the earth, and let go, deeper and deeper. The more we allow energy to move through us without resistance, the more we get to experience moments of radiant fullness, connected to our place in the web, strong in our clear presence, humbled by all that is beyond our control. In this state of surrender, we feel empowered to choose our next step. Our hearts will not stop their work of breaking, but we will stop hoping for that anyway. Often the most we can do is honor the water’s wise path, sometimes bone dry, sometimes teeming with life. Listening, trusting, listening, trusting. I trust my body as an extension of the earth, my vision as an extension of her knowing. I trust her cycles and I trust my own. I listen to what calls me further in. I trust presence, the movement that spirals out from stillness. I listen to what I don’t understand. I become the river who always meets the sea. We are not initiated once, but thousands of times. Many of our leavings and arrivals are barely noticeable, but we notice, and we are changed. We are led, continually, over thresholds we cannot plan for. Divine order changes its tune as we sing along. And the chords we strike, just by being, create cosmic waves. Barely perceptible or earth-shaking, our energetic signatures exist here as an essential part of our collective experience. As we empty the vessel of striving, we make space for what forces desire to come alive through us. It is simply a welcoming. An opening. A walking through. We are merging worlds, grooving gracefully and tumbling foolishly between the accepted and the unacceptable, learning to tone in resonance with Mystery, breaking contracts with which we no longer agree, weaving our stories one revelation and one question at a time. One toe always in the water, inviting the ceremony of entering. The soul is not static. Spirit shifts. Bodies soften and harden with the rivers and tides of time and emotion. The mind is as pliable as it is powerful. We are called to crack open wide, not for ultimate bliss but for ultimate presence, as we leave behind the comfort of knowing and enter the realm of soul that begins at the edge of the woods, at the precipice of comprehension. Transformation asks of us full devotion. It can be terrifying, to let go, yet it is the only thing that ever really happens, awakening in the center of silence. Even stillness changes shapes. But your hands know the heartbeat of everything. You will remember. And it will be beautiful. As I settle in and acclimate my system after any journey, it is important for me to commune with the language of the land in order to get grounded and fine tune my energetic alignment (just as essential as finding my favorite cheese shops and bakeries, of course!) This feels important especially when I travel alone, as it amplifies my awareness; connecting to the earth, our place of belonging wherever we are, is essential. The land here in The Netherlands is flat, and the water, contained by canals, creates a circuitry of calm; it is 10:00 at night now, and summer’s golden glow just left the tops of the trees. When I traveled here last year, I was coming from the Mediterranean, whose firefly-filled summer oozes a lush volcanic chaos; the ancient energy brought back pieces of my soul that had been hiding. I found an owl feather (the one shown above with today’s cards,) beneath a pine tree on the coast of Tuscany, overlooking the sea. I saw the feather at my feet right before I decided it was time to leave, and make my way north. I ended up in the same place I find myself now. I thought I should bring the feather with me on my journey back here, as I connect in with layers of my inner being that show up when I venture across eight time zones and an ocean. Under a sycamore tree a few days ago, across the water from a medieval bridge whose gothic turrets inspire faerie tale visions, I was transported by a familiar scent on the wind. I remembered what a sycamore in a California canyon told me as I visioned beneath her a couple months back. She said to me, “sit in stillness and let yourself be moved.” I felt that was the gentlest way I had ever heard transformation explained (leave it to the wisdom of trees!) As I continued my walk through the cobblestone streets, past giant hydrangeas, swans gliding in the canals, and cats playing, I found a ceramic sign embedded in the ground, breathing the word “earth,” up to me. I ride the waves, and I trust the unearthing, the shedding; this is the process through which we live out our soul’s weaving. Trust the inhale, the exhale, and every in between. Trust the feet and open them to the radiant currents. Trust the inner compass, the golden thread, connecting the heart of the cosmos, the heart of the animal body, and the heart of the earth, sacred from every angle. Primal and ethereal threads are woven by the hands of Grace, skin weathered like human hands, if I see them through my human eyes, the most tender expression, still made of light. We are always emboldened inside transformation’s unpredictable trajectory. Uncertainty is often our ground. With the earnest intention of full bodied, heart felt presence, we become. And we remember. Even in the forgetting we can be Fluid. Fortified. Anchored. Ethereal. Here. Healing might happen in a doorway. It might happen in the middle of the ocean, alone with the morning star and no shore in sight. It might happen in a room full of people you love, where no words are needed because you have loved each other for lifetimes and there is nothing left to prove. It might come one morning, as an answer to a prayer you forgot you prayed, with a sweet lung-heavy ache for how long it took you to know the fullness of your magic. Or maybe it never happens at all. Healing is not inevitable on the journey; you can fight your way through or give up completely. For some there is not enough time in this life to make things ok, whether by choice or circumstance, and no path is worse than another. Some are up against walls that won’t be busted through, and some won’t get the tools needed to repair their stranded boats. People can only do what they can. There is still beauty there. So whatever you are “blessed” or “cursed” or compelled to choose or be chosen by, know that you can’t think your way into letting go, but that is all you will ever do. And you can’t hope for something better without doing something better, or without letting go completely of what “something better” even means, so you can just be here, unraveling knowledge for bone deep feeling. This is the wilderness of soul, becoming undone continually so you can know yourself completely— in devotion to a love whose task is to open you — in grief, in fear, in everything you don’t understand. Healing will remind you of your spark while you’re neck-deep in mud, thick with doubt and the seeds that will carry you into the light of the front porch of God, who will answer the door even if you don’t believe in God, who will love you even when you don’t love yourself, who will hold you until you break into a song of tears that run like hot petals on your face, until you can see yourself through those eyes, as beloved. At the core, there is only love and the map you chart. The one you chart, crumple, toss, and chart all over again, navigating mysteries and connecting constellations across the heart of this living planet. The earth is a good place to be. Remember this when you have forgotten. Make this known for you however you can. The Magician is the second card in the Major Arcana, arriving on the scene after The Fool embarks on his journey. He is an alchemist, who is all about personal power, imagination, and manifestation. You have probably heard the phrase, “As above, so below,” but, what does that mean? The Magician acknowledges that the outer world is a reflection of the inner world. As a bridge, or conduit, of universal energy, he recognizes that being in balance on all levels is the key to creating experiences that serve the highest good of all. He knows he is not separate from the great expanse of all that exists, ebbing and flowing with the cycles of the earth and the cosmos. The journey with this archetype is about a commitment to knowing ourselves and creating what we desire within the natural unfolding, by focusing on working with our own life force. The Magician honors our vision and individual expression as a vital piece in our collective evolution. A master of the process of manifestation, The Magician reminds us that things can change and come to fruition when we shift internally, aligning our innermost beliefs with clear intentions, and taking action in a state of trust. Healing deep layers of beliefs around lack of worthiness and capability will be a part of this process. This happens in the body and psyche in a feeling (energetic) state, not a thinking state. Positive thinking alone doesn’t change reality if inner work hasn’t taken place. If you can acknowledge where you have tender spots — such as those aspects of yourself that are fearful, resist receiving love, or have the compulsion to lay blame — you can hold them in gentleness, respect them as parts of yourself that serve as protectors, and set them free with unconditional love and compassion, so fresh energy that is in resonance with the experience you desire can exist. Inner work is alchemy in action—the continual movement and transformation of energy from one form to another. This process is an exploration of where you need to call your power back and focus on your own energy. You will begin to know your wholeness through feeling, loving and integrating all aspects of yourself. Profound shifts can occur very quickly sometimes, but healing takes time, and you will revisit different layers of the same patterns so you can continue to grow, love what is hard to love, and clear stagnant energy to nurture creativity and a deeper sense of aliveness and connection to your own soul. It takes immense courage and devotion to meet the self, in all its facets, and it often takes much more time to create something than we would like it to. It takes focus just as much as surrender. It also requires remembering that you are whole just as you are, and nothing “out there” will fill you up without this knowing. There is also nothing within you that is not deserving of your full love. With heartfelt, mindful presence, you can feel gratitude for that which is here already. Remember that the Law of Attraction is worth understanding at its deeper levels, and it gets really whitewashed and glamorized in the “new age” biz; from this shallow and often harmful depiction, the reality of systemic oppression of people of color, women, those who are non able-bodied, neuro-diverse, gay, transgender, etc, is denied, and the experiences of people who are shamed in our society remain unacknowledged. I will be honest and say I am at an advantage as a white woman, and because of this I choose to use that privilege to be a voice for those whose voices are not heard and whose lives are endangered or encumbered. I am still learning how I can best serve from this place. To understand creating your own reality from a deeper perspective, it requires taking into account that the structures our world has functioned upon do not offer an even playing field, and not everyone has equal access to tools that will support their healing and thriving. If someone is continually traumatized by violence, racism, sexism, hatred or poverty, and has little access to support and healing, their ability to “vibrate higher” is limited, and the system can continue to incarcerate, criminalize, and silence them. When society tells you what your worth is based on who you are or what are able to do, and systems are in place to keep you down and make you unsafe, there is a host of problems that are difficult to “manifest” your way out of. Other details seldom explained are that sometimes you manifest just what you wanted, but it no longer fits with where you are in life. Be honest with yourself. Sometimes what you manifest doesn’t look like how you thought it would, but if you trust the feeling of it, roll with it. And sometimes you manifest things that you desire, but are neither prepared to contain nor sustain them. Going slowly, and respecting your own rhythm and divine timing, will ensure that you manifest in a way that truly nurtures you and sets you free in all the ways you want to feel free, along with the collective. Our consciousness can shift very quickly, but changes within the body and societal structures take awhile. Avoid getting into shame or thoughts of “something must be wrong with me” when life gets hard, and no amount of inner work seems to be changing the outer experience. Sometimes it is NOT you at all, it is the world you live in and those who are running oppressive energy and beliefs. The perspective of your higher self reminds you that there is always evolution occurring, often beyond the comprehension of your earthly self. Blaming and shaming yourself or others for not being “right” or “in alignment” only causes further harm. Allow yourself to have your experience, and others to have theirs, even when it is challenging and there are no easy answers or quick fixes. Notice how miracles show up that you could never have expected, as you direct your focus to the now and practice acceptance and non judgment. Let the energy move through self expression. Stay with, and love through. Be a light for the world and listen to those who have been oppressed, and all those pieces of within that have been silenced. My favorite way to enter into a state of altered awareness in which I can work with my energy to release and “call in” is through meditation. It could be a moving meditation like walking silently in nature, dancing, qi gong, breath work; getting into a creative zone; receiving bodywork and energy work; doing a sound meditation like drumming or singing; or laying down listening to a guided meditation with visualizations, or just simply being with the present moment— anything that allows me to be fully with myself and in my own energy. Find what works for you, as that is where true magic happens. The marvelous thing is that you get to adjust your own vibration to create change in the environment. Shifting your perception, and thus your experience, is always possible. Once you feel clear, spacious, and balanced, get still, and allow yourself to feel your desire in your body; expand on this feeling, let it flow through, and let it settle in. Your experience is sculpted from here. In addition to the above practices, I call upon my higher self, and ask my guides and angels to help me clear away anything that is hindering the flow of my life-force across time and space. I ask any pieces of myself that I have given away to come home. I ask that anything less than love and truth be dissolved, and that the clear light of love heal me and all beings. I ask that universal life-force energy move freely through me, anchoring light, so I can be a channel of goodness in the world. Then, I let it all go. It is all a beautiful experiment, and mostly a practice in love and trust. Stay in awe. Stay grounded, neutral, and trust the timing and the process. Go make magic! If the core of reality and who you are is formless awareness, and all the stuff of your daily human experience “accessories,” then you can imagine that magic is not unlike redecorating the set of the movie that is your life. Center into your energy. Visualize what is. Clear your energy. Feel into your dreams. Visualize them. Write about what you would like to create in this current act of your life. Write about how you would love to see your life in 2, 5, or 10 years. You can also create imagery through collage, painting, or drawing on a vision board. Have fun with it. Your dreams don’t have to be grand to be meaningful to you and the world. What you are pulled towards means something. What interests you means something. Envision. Explore. Shift. Actualize. Example: I believe I am a creature of unbridled joy in every cell of my being. I intend to create joy from the inside out and experience joy wherever I find myself. I will engage in activities that bring me joy. I will move this energy to shift any perceptions, which helps me make changes where I feel a lack of joy in my everyday life. I trust in my capacity for joy. I trust in the divine to support me. I let go of expectations and receive miracles, feeling my way through. I am grateful for the joy that is here now. I follow signs and synchronicity and revel in the joy that brings. I get curious about joy. Once you begin to write, draw, or collage your visions, do you notice if any resistance is coming up? What needs identifying, accepting, loving, and releasing so you can shift into a wider field of possibility? Can you notice how the resistance is showing you something important about what you may need to explore more? Do you notice how exploring these sticky places creates space for new visions and ideas to come in? How deeply can you surrender to the natural unfolding of your life, beyond your own expectations? What does it mean to be a co-creator, bridging human and divine will? Write about what destiny means to you. In what ways can you engage with your experience as a piece of living art? What adjustments do you want to make to your moving masterpiece? How does engaging in creative pursuits open you to more energy and inspiration to work with? How do you deal with a lack of inspiration, and get those creative juices flowing again? Do you notice how “doing nothing” increases receptivity to inspiration? If you are divinity or consciousness experiencing itself through the lens of your particular human embodiment, how will you use this awareness to create a variety of experiences that bring you and the world around you more beauty, joy, truth, freedom for all? The Major Arcana in the Tarot is a series of 22 cards that follows The Fool’s Journey, or as Joseph Campbell called it, The Hero’s Journey. Each of the cards in The Major Arcana depicts a symbolic expression of the human experience, called an archetype. Engaging with the energy of each archetype helps us connect to soul and be present in our own evolution. The Star is the 17th card in the Major Arcana, coming to us as the soothing light and transcendent energy after a passage of darkness — illumination in a time of far-reaching transformation. The Star pours celestial medicine down upon our tired souls. We drink deeply of her generous offerings, bathed in blessings that purify, cleanse, and soothe — a peaceful salve on our wounds as we kneel by the riverbank, dawn breaking on the horizon after a dark night of the soul. There is a sigh of relief, as we open our eyes and see that nothing is as it once was; we have been transformed and thus the world sparkles a little differently around us. Like a newborn child with ancient memories, our skin is new but we are tender, our inner scars echoing stories of the difficult journey. Wobbly-legged and bright eyed, we are given a chance to begin again, to wake up to the wonder of a new beginning. Our task is to stay open and receptive to the abundant gifts and blessings offered to us now. The Star tells us we have known the groundlessness of profound change– what it means to doubt ourselves, to feel lost in caverns of uncertainty, to not know what it feels like to trust ourselves or others. When we have lost faith in the unfolding of our lives, and wondered what the purpose is in the struggle, the Star reminds us that we have been forged in the fires and are being offered reprieve on the other side. The light has returned. Through these trials we have encountered the divine spark within that remains no matter what has been stripped away. Here we know the truth of our basic goodness, our light, and our beauty; we have touched the essence of who we are, that can never be taken from us. We carry a renewed sense of intuitive awareness, and a sense of calm that tells us all is meaningful. There is a richness in this place, an opportunity to open to a greater sense of connection to our true selves, to each other, an awareness of our integral role in the web that we weave together. The Star brings us into alignment with self-trust, self-esteem, and purpose. It carries a visionary energy that attunes us to otherworldly wisdom, ideas, and creative energy, the kind that pours through us like a fountain of inspiration. The Star encourages us to understand our worth, and to share generously our gifts with others, without fear of how we will be received. We are encouraged to stay open to miracles, and to know our divinity, shining from the innermost vaults of our being; we are empowered to trust in our highest hearts, to have faith in the magic that we are, and in the visions that call us and the collective into deep healing and renewal. Unhealed parts of ourselves will hinder the clarity of our intuition. Our intuition is in its optimal state when we have lovingly called home our wounded fragments and are standing inside our wholeness. Can you explore what your intuition feels like in your body, when you are coming from a place of wholeness? What does it feel like when you are acting from a wound or a fragment? Can you identify your protective pieces? Offer compassion to yourself here, before reacting from here. Can you identify the neutral space of intuitive awareness? Act from here. Note that making snap judgments is not your intuition at play; judging others is a key to where you can go in and work on healing a wound; intuition feels like a calm, and neutral awareness. As you continue to heal, and trust yourself more and more, your intuitive abilities will get stronger and more clear. How does self-nurturing and healing bring you into a deeper state of self trust? How are you receiving the blessings that are being offered to you? Clearing and reprogramming old beliefs and patterns, held on subconscious, physical, and energetic levels, is important so you can fully show up and receive the beauty of a new beginning. After a time of profound change, it can be difficult to accept the peace, beauty, and love that is being offered. First of all, know that it is a process and one that takes time. Healing is about integration of all aspects of our experience, not banishing any part of it. One tool for receptivity is asking your higher self what affirmations or shifts in thinking and feeling would help reframe your experience. (For example: I am safe, I am whole, I am loved, I am powerful, I belong, I am free, I am receptive, I trust myself, I love myself, I am excited for this newness unfolding, I surrender to the flow of life, I gracefully accept the love and blessings being offered, absorbing them graciously and lovingly into every cell of my being, etc.) Write your own affirmations and practice them daily along with committed self-care, as you let the new information settle into your system as fresh beliefs and perceptions. The light you consistently bring in and embody will illuminate and flush out old and unnecessary patterns as you grow and come into your new way of being. Bodywork, breathwork, energy work, rest, creativity, exercise, time in nature, time with friends, time alone, laughter, and tears can all be forms of self-care. Slow down and ask yourself what you need right now, and trust the answer. Ask your guides and angels for healing and support if that resonates with you. Also, reach out for professional help if you need it; healing needs a safe container and there are healers, therapists, and teachers with extensive experience and training who can assist you. Find those who are in integrity, well-trained, and who fit well with you. Cherish yourself as you would a small child, practice compassion and gentleness. Start where you are. We are dancing through new territory all the time, riding the waves. Sometimes it is slow, soft, sometimes it is intense and feral. It is all vital, and it is all ok. Your experience is valid. Take your time. How can you commit to a practice of gratitude? What are you grateful for right now? What are you grateful for in the morning? Before bed? Can you be present with your struggles and be grateful for how they break you open, expanding your capacity to receive? How can you stay grateful for the simple things, even throughout the toughest trials? How does celebrating the little moments of love and beauty awaken you to your true self? How does a daily gratitude practice shift your perception of your reality? Write about your experience with miracles. What miracles have restored your faith in a higher power, in your higher self, or in some divine orchestration? Or, do you see miracles in a different way? Do you witness the cycles of the earth and your own body as some miraculous and mysterious unfolding? How can you live so as to believe yourself to be a miracle, and every breath another opportunity to create and experience more miracles? How can you appreciate other people as miracles? How can you shift your daily routine or beliefs so as to expect miracles on a daily basis? In what ways do you care for your body? Your mind? Your spirit? Your heart? What does a daily commitment to self-care and self-love look like? How do you cherish yourself? How are you devoted to you? Have any insights, ideas, or visions been coming to you? Are you noticing synchronicities, messages or patterns that keep showing up? Is there any resistance to trusting the intuitive messages you are receiving? What emotions or pieces of yourself need to be acknowledged, felt, loved, and integrated, so you can be an open channel of light, wisdom, and love? What you notice is important. What you feel is important. What comes up for you matters. Write down anything that comes to you that feels meaningful, without any care as to whether it makes sense. Or dance, sing, paint, cook, make love, make an altar, do free form yoga, garden, etc, to get into the flow. Let the insights, ideas and inspiration come through you, as if you are a vessel of magic (because you are!) See what happens when you let your creative energy move without judgement. See how trusting your intuition sharpens it. Stay curious and open to beauty and joy. Shine just as you are. And then we celebrate this pulse that carries us, the force that holds us close in even in the leaving, in between the laughing and the crying, over meals with flowers and candles who flicker like we do, ever in motion, burning, alive and fading. Gratitude is too small a word for the chance to have known the beauty of us being here, together. Then there is a postcard from a faraway friend that shows up just in time, because if you ever forget this bottomless spring of forever love we are made of, you will remember now that you never had to search it out. It was here, it has always been here, and when we are gone, it will be still. This is it—your being here, your experiencing this, now, not as you had imagined it, but the raw reality of what-is-really-happening, moving through a moment that pulses with the colors of every moment, felt as only you can feel it, lived as only you can live it. And there, there’s that stillness to settle into, the stillness that is never truly still, the miracle of creating a home inside your own vision, a place to thrive on this wild earth, the awareness of the gift of this flesh deepening wherever you land. The only thing between your inner wise one and your inner wounded one are your loving hands, extended forth, introducing one to the other. They will recognize themselves in each other, and it will feel like coming home. Don’t deny either one the remembering, of where the other came from, and where from now on, they can go together, hand in hand, wisdom guiding pain into deeper acceptance, pain guiding wisdom into deeper waters. Your living light is expanding at your center, into the space and softness where you and the mystery breathe each other. And now all of creation is singing into the bottoms of your feet, the sound vibrating through the ends of your hair, about the radiance of becoming, about the purpose you set out for, and the purpose whose layers will unfold in their own time, in this continual coming home, this ever-opening state of revelation.